Download the complete volume for free (7.4 MB, pdf). Buy the printed edition ISBN 978-1-4632-0221-7. Grace Aguilar was an early nineteenth-century Anglo-Jewish writer who concerned herself with the reform of Jewish religion and its relationship to Christianity in her theological works, novels, and poetry. She was interested in challenging the ways in which Jews and Christians represented each other in their teachings, tried to present both perspectives on the vexed question of Christian mission to the Jews, and sought to demonstrate that the theological barriers constructed between the two faiths were often less immoveable than tradition would have it. As a female Jewish theologian writing well before her time, she offered a remarkably innovative conception of female spirituality that allowed her to cross and re-cross the boundaries between the Jewish and Christian religious cultures she inhabited. Conventional wisdom in studies of English antisemitism has tended to suggest that by the nineteenth century religious prejudice had largely been secularised or replaced by modern socio- political and racial forms of hostility. This may have been the case in the general English discourse, but in the English Catholic discourse at the turn of the twentieth century, traditional pre-modern myths, with their cast of Jewish and Masonic diabolists, were still a pervasive feature. This article examines a range of sources, including the published works of prominent and obscure authors, the pastoral letters and sermons of cardinals, bishops and priests, articles and editorials in newspapers and periodicals, letters, and a small number of oral testimonies, in order to bring to light an English Catholic discourse which, with the exception of the published works of Hilaire Belloc and G. K. Chesterton, has largely gone unexamined. Prominent mythological villains in the English Catholic discourse during the late nineteenth- and early twentieth-century included “the Pharisee,” “the Christ-Killer,” “the Ritual Murderer,” “the Sorcerer,” “the Antichrist” and “the Luciferian.” This article examines the continued presence of narratives in which Jews and Freemasons were assigned one or more of these villainous roles. Amy Levy (1861–1889) was an Anglo-Jewish author, poet, essayist, and translator of works, while Lily Montagu (1873–1963) was a prolific writer and the founder of Liberal Judaism in England. Despite their differing backgrounds, Levy and Montagu produced novels that converge in their portrayals of how a religion of “ritual,” Reform Judaism, failed to meet the needs of a Jewish community more and more equating morality with personal spirituality. Indeed, Amy Levy’s novel, Reuben Sachs (1888), is a critique of the recently founded Anglo-Reform congregation. Similarly, Lily Montagu’s Naomi’s Exodus (1901) expands on Claude Montefiore’s theology of Liberal Judaism that was itself a response to the stagnation of Anglo-Reformism. In these novels the religious discourse hinges on comparable portrayals of the West End Jewish community in London. This essay will for the first time connect the works of Levy and Montagu. 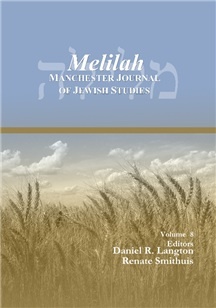 In the process, we will examine the ways in which they attempted to deal with the late nineteenth-century pressures on Anglo-Judaism to assimilate the religious, primarily Evangelical, norms of Protestant culture and to address the concerns of a community that was reading the idealistic poetry of the Romantics and the novels of Charles Dickens and George Eliot, among others. On 9 May 1945 the unconditional surrender of Germany signified the end of World War II in Europe. One of the greatest challenges faced by the international community was the fate of the refugees, those people who for various reasons could not or did not want to return to their pre-war homeland. An especially significant place within this category was taken by the Holocaust survivors – the last remnants of the ten million strong pre-war Eastern and Central European Jewish community. The relief effort undertaken in helping this group, by mid-1947 numbering around 250,000 people, was a task of unprecedented scale and difficulty. Among the challenges of that time, the education of children and adolescents was of particular importance. Military authorities, non-governmental organizations (both Jewish and non-Jewish) and finally the survivors, all devoted themselves to helping those who lost their childhood and youth in concentration camps, forced labour and in hiding. This article will discuss this issue through the case-study of the Organization for Rehabilitation and Training (ORT) and its undertakings among Jewish refugees in Great Britain. When bestowing poetic blessings upon newly married couples, the medieval Hebrew poets often advance analogies to biblical figures, indicating their wish that the couple should merit the good fortune of, for instance, the forefathers Abraham, Isaac and Jacob, or of later biblical figures such as Moses, Zipporah, Phinehas, or Hannah. The most common analogy offered, however, is that of the matriarchs Rachel and Leah, as per Boaz’s nuptial blessing from Ruth 4:11: “May the Lord make the woman who is coming into your house like Rachel and Leah, both of whom build up the House of Israel!” In this study, the usage of this recurring motif throughout medieval Hebrew epithalamia will be considered, so as to demonstrate its role as a focal point of poetic creativity.